John P. A. Ioannidis (born August 21, 1965 in New York City) is a physician-scientist and writer with contributions in evidence-based medicine, epidemiology and public health, data science and clinical research. He has pioneered the field of meta-research (research on research). He says that much of the published research doesn't meet good scientific standards of evidence. He is a Professor of Medicine, of Health Research and Policy and of Biomedical Data Science, at Stanford University School of Medicine and a Professor of Statistics at Stanford University School of Humanities and Sciences. He is director of the Stanford Prevention Research Center, and co-director, along with Steven N. Goodman, of the Meta-Research Innovation Center at Stanford (METRICS). He is also the editor-in-chief of the European Journal of Clinical Investigation. He was chairman at the Department of Hygiene and Epidemiology, University of Ioannina School of Medicine as well as adjunct professor at Tufts University School of Medicine. Ioannidis (2005) Why Most Published Research Findings Are False. Born in New York City in 1965, Ioannidis was raised in Athens, Greece. He was Valedictorian of his class at Athens College, graduating in 1984, and won a number of awards, including the National Award of the Greek Mathematical Society. He also graduated in the top rank of his class at the University of Athens Medical School, then attended Harvard University for his medical residency in internal medicine. He did a fellowship at Tufts University for infectious disease and came to Stanford in 2010. The Atlantic wrote a lengthy piece on Ioannidis in 2010. The Economist wrote a shorter piece in 2014 about the foundation, by Ioannidis and Steven Goodman, of the Meta-Research Innovation Centre at Stanford. He was profiled in the BMJ in 2015 and described as "the scourge of sloppy science". Ioannidis's 2005 paper "Why Most Published Research Findings Are False" has been the most downloaded technical paper from the journal PLoS Medicine. Ioannidis wrote that "a research finding is less likely to be true when the studies conducted in a field are smaller; when effect sizes are smaller; when there is a greater number and lesser preselection of tested relationships; where there is greater flexibility in designs, definitions, outcomes, and analytical modes; when there is greater financial and other interest and prejudice; and when more teams are involved in a scientific field in chase of statistical significance." In another 2005 paper, Ioannidis analyzed "49 of the most highly regarded research findings in medicine over the previous 13 years". The paper compared the 45 studies that claimed to have uncovered effective interventions to subsequent studies with larger sample sizes: 7 (16%) of the studies were contradicted, 7 (16%) had effects that were smaller in the second study than in the first, 20 (44%) were replicated, and 11 (24%) remained largely unchallenged. He has made many other influential empirical evaluations addressing the validation and replication performance of different types of studies in diverse scientific fields, including genetics, clinical trials, and neuroscience. His work has also aimed to identify solutions on how to optimize research practices and to increase the yield of validated and useful scientific findings. He also coined the term Proteus phenomenon for the occurrence of extreme contradictory results in the early studies performed on the same research question. He has also made a number of contributions in the field of meta-analysis (the science of combining data from multiple studies on the same research question) and has been President of the Society for Research Synthesis Methodology. ^ Ioannidis, John P.A. (August 1, 2005). "Why Most Published Research Findings Are False". PLoS Medicine. 2 (8): 124. doi:10.1371/journal.pmed.0020124. ISSN 1549-1277. PMC 1182327. PMID 16060722. ^ "Highly Cited Researchers". Retrieved September 17, 2015. ^ "John P. A. Ioannidis". CAP Profiles. Stanford School of Medicine. Retrieved May 24, 2014. ^ "Prevention Research Center". Stanford School of Medicine. Retrieved May 24, 2014. ^ "John Ioannidis". Stanford. Retrieved 2018-05-10. ^ "John P.A. Ioannidis". Department of Hygiene and Epidemiology, University of Ioannina School of Medicine. Retrieved December 31, 2008. ^ Ioannidis, John P.A.n. "Curriculum Vitae" (PDF). Archived from the original (PDF) on July 21, 2011. Retrieved November 4, 2010. ^ a b Ioannidis, J. P. A. (2005). 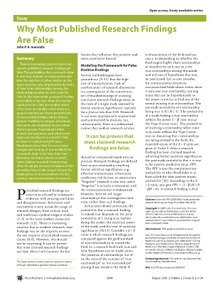 "Why Most Published Research Findings Are False". PLoS Medicine. 2 (8): e124. doi:10.1371/journal.pmed.0020124. PMC 1182327. PMID 16060722. ^ David H. Freedman (2010). "Lies, damned lies, and medical science". The Atlantic. Vol. 306 no. 4. pp. 76–84. ^ "Combating bad science: Metaphysicians". The Economist. ^ "John Ioannidis: Uncompromising gentle maniac". BMJ: h4992. 2015. doi:10.1136/bmj.h4992. ISSN 1756-1833. ^ Robert Lee Hotz (September 14, 2007). "Most Science Studies Appear to Be Tainted By Sloppy Analysis". Wall Street Journal. Dow Jones & Company. Retrieved 2016-12-05. ^ Ioannidis, J. P. A. (2005). "Contradicted and Initially Stronger Effects in Highly Cited Clinical Research". JAMA: The Journal of the American Medical Association. 294 (2): 218–228. doi:10.1001/jama.294.2.218. PMID 16014596. ^ Ioannidis, John P. A.; Ntzani, Evangelia E.; Trikalinos, Thomas A.; Contopoulos-Ioannidis, Despina G. (November 1, 2001). "Replication validity of genetic association studies". Nature Genetics. 29 (3): 306–309. doi:10.1038/ng749. ISSN 1061-4036. PMID 11600885. ^ Ebrahim, Shanil; Sohani, Zahra N.; Montoya, Luis; Agarwal, Arnav; Thorlund, Kristian; Mills, Edward J.; Ioannidis, John P. A. (September 10, 2014). "REanalyses of randomized clinical trial data". JAMA. 312 (10): 1024–1032. doi:10.1001/jama.2014.9646. ISSN 0098-7484. PMID 25203082. ^ Button, Katherine S.; Ioannidis, John P. A.; Mokrysz, Claire; Nosek, Brian A.; Flint, Jonathan; Robinson, Emma S. J.; Munafò, Marcus R. (May 1, 2013). "Power failure: why small sample size undermines the reliability of neuroscience". Nature Reviews Neuroscience. 14 (5): 365–376. doi:10.1038/nrn3475. ISSN 1471-003X. PMID 23571845. ^ Begley, C. Glenn; Ioannidis, John P. A. (January 2, 2015). "Reproducibility in science: improving the standard for basic and preclinical research". Circulation Research. 116 (1): 116–126. doi:10.1161/CIRCRESAHA.114.303819. ISSN 1524-4571. PMID 25552691. ^ Ioannidis, John P. A. (October 21, 2014). "How to Make More Published Research True". PLoS Med. 11 (10): e1001747. doi:10.1371/journal.pmed.1001747. PMC 4204808. PMID 25334033. Scholia has an author profile for John Ioannidis. Szgene.org, meta-analytic database of schizophrenia gene studies of which Dr. Ioannidis helped create.